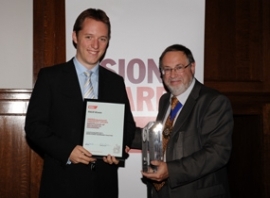 Former IfM student Philip Deakin was recently named Undergraduate Visionary of 2011 by the Institution of Mechanical Engineers (IMechE). New sound-recognition technology developed by a Cambridge company is to be used in intercom systems to protect prison, hospital and commercial staff from violence, break-ins and vandalism. Award-winning ideaSpace company Polysolar is opening a new research and development office in County Durham. Two award winning sixth form students were given an introduction to student life at the IfM as part of a week’s placement with British Sugar. A team of designers from the IfM's Design Management Group are exhibiting a novel 'moss table' at the London Design Festival this week. New research led by Professor Andy Neely, Director of the Cambridge Service Alliance (CSA) argues that a shift to services is vital for UK industry. A former IfM student, Michael Korn, is the UK winner of the James Dyson Award, an international design competition run across 18 countries. IfM Head, Professor Sir Mike Gregory, has been elected a Fellow of the Royal Academy of Engineering in recognition of his distinguished career teaching and researching at the forefront of Engineering. Twenty-three children from a Chelmsford secondary school spent a day at the IfM, having fun and learning about manufacturing engineering. The cream of European engineering talent will be converging on Cambridge next month to take part in an annual international competition. Michael Herring, an apprentice at the IfM’s Centre for Industrial Photonics (CIP), has just been named Apprentice of the Year by Cambridge Regional College’s Engineering Academy. A new multi-million pound science and enterprise hub designed to encourage collaboration and foster the commercialisation of scientific research and innovation, has been officially opened by Science Minister David Willetts at Colworth Science Park, Bedfordshire. An IfM doctoral student is playing a leading role in trying to find budding Bransons in poverty-stricken Rwanda. The IfM is to be a major partner in two new research centres designed to help boost UK manufacturing. The Institute is a partner in both the new EPSRC Centre for Innovative Manufacturing in Ultra Precision and the EPSRC Centre for Innovative Manufacturing for Continuous Manufacturing and Crystallisation. Dr Bill O’Neill was recently elected by the Council of the Institute of Physics to a Fellowship of the Institute in recognition of his personal contribution to the advancement of physics. The Open Innovation Research Forum (OIRF) launched with a two-day ‘fast start’ research proposal development workshop. The OIRF workshop – sponsored by the UK Innovation Research Centre and Japan’s Institute for Technology, Enterprise and Competitiveness – brought together 40 representatives of multinationals, open innovation intermediaries, and academics from around the world to discuss the links between geographic location and the successful implementation of open innovation. David Gill, a Senior Research Associate at the IfM, has received a prestigious award for Outstanding Contribution to Business Incubation 2011. The IfM is to be a major partner in a multi-million pound project to establish a new national research centre in the field of industrial sustainability. A high-profile US trade mission visited the IfM as part of an international 10-day trade tour of Israel and the UK. The IfM is to receive a visit by the State Governor of Massachusetts, Deval Patrick, and his Innovation Economy Partnership Mission team. Mr Liu Xiaoming, Chinese Ambassador to the UK, visited the Institute for Manufacturing to discuss the Institute’s connections with China and explore opportunities for future collaboration. The President of the European Commission, José Manuel Barroso, has visited the IfM. An ambitious research project aims to improve the chances of success for new products – by studying the role of senior management in the development process. A delegation of Mexican government officials paid a visit to the IfM to find out more about the Institute’s research on industrial policy and its role in assisting small businesses. Seven projects designed to support innovators and entrepreneurs across the Eastern Region have been announced by the ideaSpace Enterprise Accelerator (iEA).